One of the reasons I started Primer was because I felt like there were a lot of issues I was facing that no men's media was talking about. Chief among them: Knowing how to decipher if the person you're dating is who you should spend the rest of your life with. Our 20s and 30s are filled with contradicting orders about dating. Most of our culture is rife with “getting laid is the most essential thing you need to be doing right now” garbage; from bloggers, pick-up Youtubers, podcasters, to literally every single male character on screen. And at the same time, we receive the complete opposite instructions by way of siblings and friends getting down on one knee to make the ultimate commitment. Some of them seem unfairly perfect, others clear examples of what we don't want to be or want in a relationship. So we're left with scattered shreds of mixed messages for us to pick up and try to piece together, hoping that we'll get it right. I'm sure many of you are going through or have gone through relationships where you feel like…they seem like a good partner? There are some issues, and I'm strangely not THAT excited about them…but maybe this is how it's supposed to be? Maybe this is as good as it gets and I'm stupid to throw it away? If there's one thing I've become confident about having been in long, loving (9 years) relationships and brief, but passionate trysts, is that the cliché is absolutely, 100%, unequivocally true: You'll know when you know. And if that sounds disgustingly romantic or unhelpful, it also means this: If you don't know, then that's enough to realize they're not, at least right now, The One. 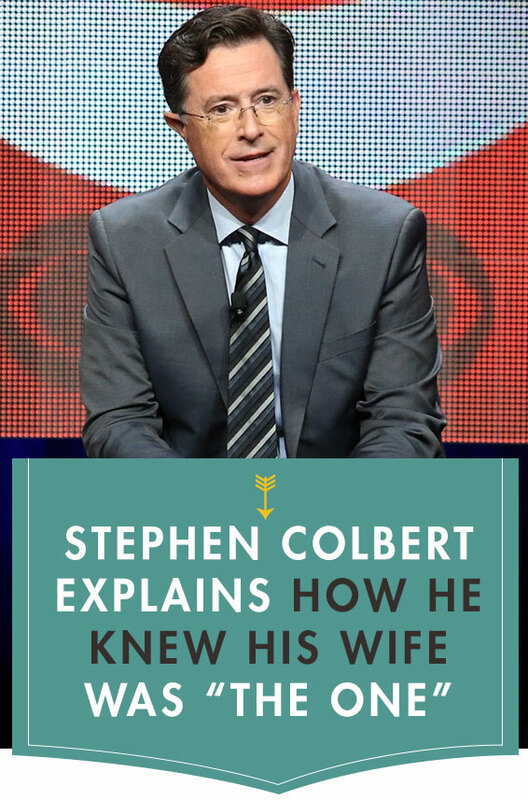 Stephen Colbert has a reputation for being a hell of a romantic gentleman, and this story, where he describes his own wrestling with if a woman was The One puts a lot of guys to shame. But what I want you to really take from his story isn't that there has to be a fairytale with a dramatic beginning, middle, and end, but that when you're with the person who should eventually be your spouse, you'll be excited about the possibility. You're so passionate about the idea that you share your own story with your friends and family. Because when it comes down to it…if you're struggling with figuring out if your partner is The One, you already have your answer. I like it, because he is still feels the same way he did then. The walking around the references, all of it. Saw this the other day. I have nothing but respect for that man. yeahhh, this is a good post. Wish older gentlemen made an effort to alleviate the confusion for younger men. Led on?? Sounds as though she knew exactly where she stood. Putting time and energy into a relationship creates no obligation other than the candid assessment Colbert says he did.